Dialogue i s one of my favorite elements of fiction. While it seems to only show two characters shooting the breeze or arguing, it really does so much more than that. It moves the overall story forward. It provides action within a scene. It quickens the pace of the narrative. It provides tension and subtext. Of course, in order for all these things to occur, the dialogue must be written well. There are many great posts and books out there on the topic of dialogue construction, and definitely check those out as well. This is my attempt at succinctly describing what I think are the most important aspects of dialogue. Dialogue should: move the story forward. Dialogue is action, and action is movement. Everything characters say should be purposeful, even if it isn’t immediately obvious how. There are a couple places in my work where critique-ers have asked, “Was there a point to that conversation?” Yes, but sometimes the payoff comes later. Bottom line, characters should only rarely and briefly shoot the breeze for no reason. Dialogue should not: provide info dumps. Info dumps, especially the type where characters are talking about something they both already know, are the opposite of forward movement. They slam the brakes on the story to give information that may or may not be important for the reader to know (most of the time, they aren’t as important as you think). Seeing that dialogue is supposed to move things forward because it’s action, character-provided info dumps are especially awkward because they slam the brakes while they should be moving things forward somehow, and they never feel natural because they’re obviously for reader benefit. You end up with “As you know!” conversations. Of course, sometimes one character needs to fill in another on something important to the story. Things need to be explained. That's fine, but break up long explanations with beats or interruptions or something, and make them few and far between. Dialogue should: sound like real speech. Dialogue should not: sound exactly like real speech. People hem and haw and um and lose their trains of thought. Accents are fine to write, but if you get too literal in writing them, the reader will get annoyed. I think only Twain could get away with this. The physical way the dialogue is expressed should not stand in the way of the dialogue being expressed. Dialogue should: minimize the use of tags. “I thought you’d be home for dinner,” Sandy said. “I didn’t say that,” Bill responded. “So where were you?” she asked. “Out.” He stomped up the stairs. Maybe over the top examples, but you get the idea. Dialogue should not: use flowery tags. Tags are bad. Flowery tags are worse. 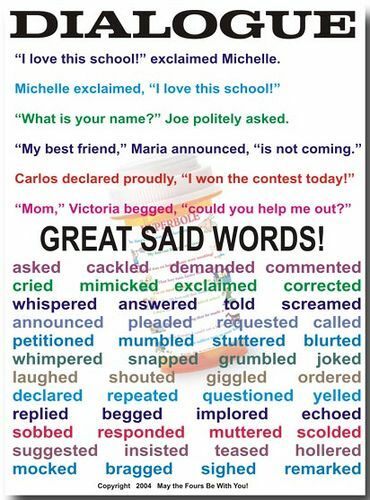 I hesitate to share the dialogue poster I found on Pinterest while looking for visuals for the post, because I fear someone may look at it without reading the post and think they should do this. DON’T DO THIS, NON-POST READERS! Flowery tag words make Baby Jesus cry. I’m sure that’s in the Bible. If you must use these, do so very occasionally. If your character is whispering, fine. She whispered. Or maybe she leaned towards him, so her face was inches from his? 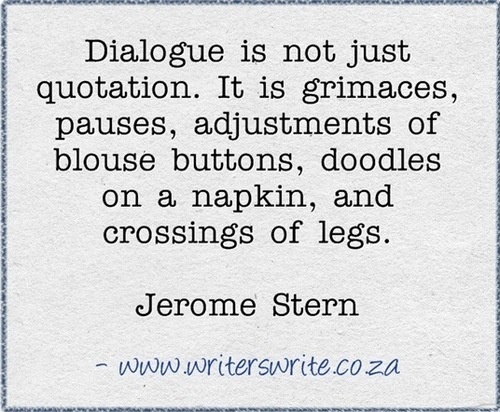 In what ways do you make your dialogue authentic? All good things to be reminded of. I know the quality of my dialogue went up dramatically when I discovered action beats. Allison leaned and and whispered, "read my blog post." Good points all. Even better than dialog are the things that go unsaid. I agree with Susie on both accounts. I love dialogue dearly. I tend to think that while action beats are great for adding to dialogue, a lot of the gold is just in what you say and don't say. People rarely say exactly what they mean, even when they're trying to say what they mean. Sometimes they don't even know what they mean. Or what they're trying to say. Or why they're saying what they're saying. That's what's so beautiful about it to me - it's human existentialism exemplified. It?s easy to write good dialogs, but it takes some practice. First, I have the conversation. I write down what two people would say, and I write it as fast as I can. It?s half jibberish, too, because I?m a lousy typist. Then, I go back and add in the ?beats? ? the little actions and other stuff that people do during conversations. Because if I try to do it all at the same time, I usually miss something. Like the timing of a conversation, which is most important. In real life, people cut each other off, or change topics in midstream. That can be helpful, making the characters more realistic; or it can be a disaster, making the author seem like a lunatic. Worry not. Locking you up as a crazy is much harder than most people think. A great technique is to make a point and then answer the way people do when they?re arguing. ?I, well, I wouldn?t. But it sounds wrong.? ?There?s some logic at work. Thanks, Hemingway.? Write things the way YOU argue ? and do it quickly. Go back and add in the commas and other punctuation afterwards, and make sure the conversation is slightly combative. People tease and contradict. Look at your text messages between you and your friends. Are they all facts or is it fun? Does your Facebook chat contain witty banter? No? Time to make some new friends! If yes, then use that as a guide. Get it down first, then finesse it, soften it, whatever. And don?t worry about grammar. Why? Because very few people speak with proper grammar. Tweak it later. Now, the conversation above was like 4 lines long, then I went back and added an insult. Cos people do that, even if they like each other. Then I added the last two lines because it can be amusing to see one person start to go off the rails and the other person not bother to reel them back in. It?s fun for me. Then add the beats. What does a stressed out lady do when she?s sitting at a table? Tug at her earring? Twist up a napkin? Stuff like that makes for good beats. Allison showed some examples; get creative. You may mess up your dialogs until you develop an eye/ear for what works, which requires being a bit of an actor? Which is a lot of work, actually. But hey, who said it would be easy? Oh, I did. Good dialogs do one more thing: they make your characters memorable ? which makes your story memorable. Which makes you memorable, binkie! Wow, how embarrassing to have my apostrophes and quotation marks come out as question marks. Twice. Whenever I read a story, I always enjoy the dialogue part and get really bored when having to read all the descriptive stuff, scene setting and all. Dialogue is exciting, and happening. I'm trying to incorporate that into my story, but am finding it difficult at times. I worry about being too descriptive using dialogue. I don't want to come off in a bad way either.